New Balance 1080 v5 are neutral cushioned running shoes. The New Balance 1080 v5 is one of the flagship models from Boston's (along with the 890 v4) brand and really popular among neutral runners looking for great balance between cushioning and effective response for long runs. It features good stability although no proper motion control present. Slightly heavier than its predecessor the 1080 v4, it has a synthetic seamless mesh upper with new design of welded overlays (FantomFit) and improved distribution of lace eyelets to provide a better (and softer) fit. Stability mentioned above is provided by asymmetrical heel counter for lower lateral support and the redesigned T-BEAM shank which delivers torsional stability through the midfoot. 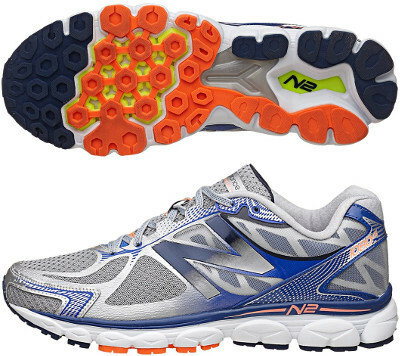 Although not the most cushioned model within neutral shoes range from New Balance (position held by the 880 v4), it features great comfort with 2 layers of midsole foam: durable ABZORB® foam closest to the ground working together with premium N2 compound (TPU with nitrogen-infused) in the heel and N2 Burst in the forefoot to improve response.